Cure those winter blues with a delicious Instant Pot Huli Huli Chicken that tastes like paradise, minus the air travel! Mix all of the marinade ingredients together, stirring until the sugar is dissolved. Place chicken in a large zipper top bag or bowl. Pour over the chicken and marinate for at least one hour or over night. When you are ready to cook your chicken, place a trivet at the bottom of the liner and add the chicken stock. Place the chicken, breast side up on top of the trivet. Pour the marinade over the chicken. Set the pressure cooker to Manual and set timer for 30 minutes by pushing the + and – buttons. 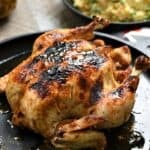 Very carefully remove the chicken from the pressure cooker and place it on a baking sheet or cast iron skillet/griddle. Press the “Cancel” button, then the “Saute” button. Scoop out 3 Tablespoons of the cooking liquid and mix it with 2 Tablespoons of cornstarch in a small bowl. Pour the mixture into the cooking liquid and stir to combine. Cook until thickened, and brush on the chicken. Place under the broiler for about 5 minutes until bubbly and caramelized. Allow chicken to rest for 5 to 10 minutes before serving. Serve additional sauce on the side if desired. For a prettier presentation use baker’s twine to tie the legs together before cooking. Like I said, my chicken was 5 pounds so I cooked it for 30 minutes. The general rule of thumb is to cook for 6 minutes per pound. If your chicken is 3 1/2 pounds, round up to 4 pounds and cook for 24 minutes, etc.